There are a plethora of resources available to therapists, educators and parents regarding self-regulation and sensory-based strategies. However, we do a disservice to individuals when we use quick fix behavior solutions or a narrowly-focused approach for all children. This course will present a theoretically-sound, evidence-based, and developmentally-driven method for approaching each individual child’s self-regulation needs. We recognize that self-regulation is not merely the management of a prescribed “sensory diet” or “behavior chart”. 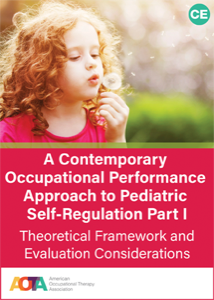 Self-regulation is a complex issue that affects all aspects of an individual’s well-being (physical, cognitive, emotional), as well as their surrounding relationships (family, peers, teachers), and ability to engage productively within varied environments. In this first part of the 2 part course, we will present an evidence-based theoretical foundation for authentic practice with children and youth who struggle with emotional and behavioral regulation. We will offer a comprehensive framework for evaluation from an occupational performance perspective, focusing on assessment tool selection and developing a comprehensive, yet targeted measurement model. Theresa Henry, MSOT, OTR/L, serves as the lead Pediatric Clinical Specialist for Children, Youth & Family services at Washington University’s OT Community Practice Program. She has 24 years of experience working in a variety of settings, including acute rehabilitation, long-term pediatric rehabilitation, school-based therapy, and in-home services. She also served as a related services administrator at Special School District of St. Louis County, where she coordinated OT, PT, adapted physical education and assistive technology services. 1. Explore occupation as the catalyst for child development. 2. Describe the interrelationship between intrinsic and extrinsic factors on client outcomes. 3. Respond to interdisciplinary team members about how to comprehensively assess and target individual challenges. 4. Explain the relevance of outcome-focused evaluation considerations. 5. Select assessment tools that are relevant to your practice setting, client priorities and occupational performance issues.